The 10 Best RV Trips To Take In Rhode Island - Must See! Rhode Island may be small, but it’s certainly big on adventure. Its oceanfront retreats attract millions of visitors each year, creating an influx of tourism in this already densely-populated state. And, while it may not be the best destination for avid climbers (Rhode Island is mostly flat), it happens to be one of the biggest hot spots for beachgoers and cultural explorers. Rhode Island’s history only adds to its allure. As the first colony to declare its independence from Great Britain and one of the first states to encourage religious freedom, Rhode Island became a hub for individualism. However, the state also had the highest slave population in New England; its history of slave trading adds a grim layer to Rhode Island’s otherwise enlightened past. After the civil war, Rhode Island saw an era of great prosperity as an industrial seaport and manufacturing giant. The grand mansions that were built during this period still attract thousands of annual visitors today. The mixed bag of Rhode Island’s geography, culture, and history make it a top destination for families of all ages. Countless cultural landmarks, opulent mansions, regal gardens, and seaside attractions are just a few of the reasons why people flock to the Ocean State. Whether you rent an RV in Rhode Island or bring your own, you’ll find no shortage of places to explore. In this article, we’ll show you some of the best. 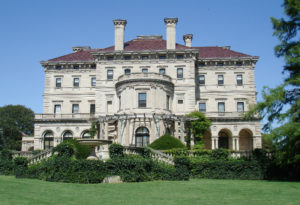 If you’ve ever wanted to tour an exquisite home, visit The Breakers, Rhode Island’s largest and most luxurious “summer home.” Commissioned by a member of the prominent Vanderbilt family in 1893, this staggering mansion is now registered as a National Historic Landmark. It’s a sprawling, 70-room estate appointed with grandiose architecture and décor. Hardly the average person’s idea of a summer cottage, The Breakers reflect what life was like for one of the world’s richest families. Surprisingly, it’s not the biggest home this infamous family built, either. The Breakers has been open for tours since the 1970’s. Visitors will be able to explore the mansion in all its Italian Renaissance glory, from the home itself to the stable and carriage house. Recently, the Preservation Society opened a new tour of the underground tunnel and basement, where guests can see an example of state-of-the-art technology for that time. Price: Prices vary by tour package. See site for details. Most of the RV parks in the vicinity are monthly and seasonal parks only. However, Second Beach Family Campground, just across the bay from The Breakers, offers nightly rentals starting at $70 per night. They offer full hookups at each site along with access to Second Beach (which is just steps away). There are a limited number of sites, so try to make a reservation as early as possible. 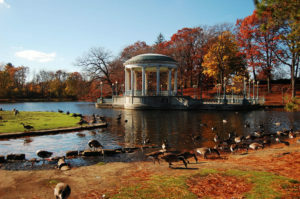 Located in lovely Providence, Roger Williams Park features one of the oldest zoos in the United States. The park itself contains more than 400 acres and seven small lakes. A variety of attractions can be found here, including a planetarium, botanical center, Japanese garden, a carousel, and more. The Roger Williams Park Zoo is perhaps the biggest draw, as it has hundreds of animal species and exhibits throughout the property. The snow leopard and cheetah exhibits are always a hit with the kids. There are a variety of seasonal events at the Park as well. The fairy house display in April is a family favorite and features an entire village of tiny homes and shops for fairies, pixies, and goblins. Summertime is the perfect time to grab a boat rental and cruise around the lake. In the fall, the park offers a quiet place to check out the changing autumn leaves or check out the thousands of carved pumpkins on display during the Jack o’ Lantern Spectacular. Trust us; you’ll find something exciting to do no matter what time of year you visit. Price: Park entry is free; zoo admission varies. It’s going to be tough to find camping in Providence, but there are a few options just outside of town. Holiday Acres Campgrounds is likely your best bet. They offer full hookups and an array of amenities like a pool table, horseshoe pits, a camp store, adult game room, and more. You can also check out our list of RV parks in Rhode Island for similar campgrounds with lots of amenities. This next one might not sit well with the kids – or maybe it will, who knows? 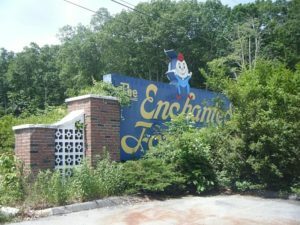 What once was a large fairy tale theme park now stands eerily demolished and overgrown, save for a few structures, bumper cars, and a mini-golf course. The creepy atmosphere of a long-forgotten childhood playground is enough to send shivers down your spine. It’s also a great place to do some urban exploration and take a few spooky snapshots. There are a few other things to do in Hopkinton as well. It’s a rural area, so nature preserves and outdoor excursions await around every corner. There are fishing ponds and swimming holes to the north, the historic Black Farm to the east, and petting zoo/working farm in Hope Valley. So, don’t worry; there are plenty of ways to fill your itinerary for a day trip to the area. Hopkinton is pretty rural, so you might find a few remote places to pull over and park for the night. If you’d like something a little more civilized, though, head to Ashaway RV Resort in Bradford. They have campsites to accommodate trailers and motorhomes of all sizes. They also have a bevy of high-end amenities, including a pool and hot tub, splash pad and playground, and a club room for adults. The Block Island Lighthouse doesn’t look like your typical lighthouse. In fact, it looks a lot more like a Gothic home with a lighthouse attached as an afterthought. In the late 1800’s, the lighthouse sat right on the tip of the Island. It had a special lens and two steam-operated sirens, which remained (aside from modifications) for over 100 years. During that time, keepers struggled to acquire funding for the lighthouse. The ocean was quickly eroding the surrounding bluffs, and the lighthouse faced certain peril. Finally, in 1993, the Lighthouse Foundation had raised enough funds and began the tricky task of moving the lighthouse inland. Today, the lighthouse stands about 300 feet away from the bluffs. It’s listed both on the National Register of Historic Places and as a National Historic Landmark, known for its rare Fresnel lens and its beautiful architecture. During the summer, guests can tour the lighthouse and explore the museum and gift shop. Don’t forget to grab a classic New England lobster roll at the nearby food truck; you won’t regret it! You’ll need to take a ferry out to Block Island, so obviously, you can’t camp there. Back on shore, though, the Charlestown Breachway has you covered. It’s a waterfront campground that can accommodate small, self-contained RVs. Guests will be treated to gorgeous ocean views, access to saltwater fishing, and an onsite beach. We’re heading back to Providence for this next stop. The infamous horror fiction writer called this city home until his death in 1937. There are several areas of interest throughout the city where guests can take a look into the mind of a macabre genius. The first is the HP Lovecraft House, his last residence before his death, and the only one that’s still standing. You can also visit his current residence, Swan Point Cemetery. 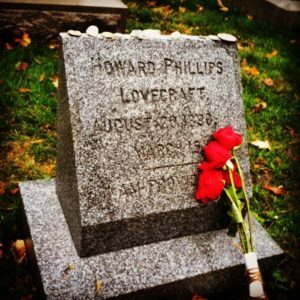 There’s even an HP Lovecraft Walking Tour available through the Rhode Island Historical Society, though it only runs for one week in October. The John Hay Library features a few Lovecraftian relics as well, including a small collection of manuscripts and letters. To cap off this creepy tour, check out the Library’s three anthropodermically bound books – they’re bound in human skin. If you’re in town at the right time, you might be able to catch an event at the Athenaeum Library, one of Lovecraft’s favored places to visit. Events range from Salon parties to concerts and more. We already covered the closest park, Holiday Acres Campground. If you’re heading south, though, Hickory Ridge Campground might be a better option. It’s a small, basic campground with 10 sites available for nightly rentals. According to reviews, rates average $50 per night. While you’re in town, don’t miss the opportunity to swing by the Rhode Island School of Design Museum. RISD is ranked as one of the best art and design schools in the United States, as well as in the world. The museum contains nearly 100,000 art pieces from around the globe, including Japanese prints, ancient Grecian pottery and paintings, contemporary works by Andy Warhol, and much more. 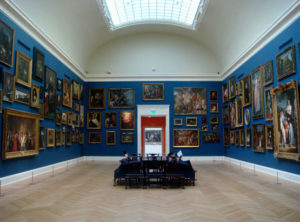 The RISD Museum also has one of the most renowned textile and costume collections on the planet. There’s just too many attractions to name here, so go and see the museum for yourself! Price: $15 for adults, $12 for seniors 62 and over, $8 for college students, and free for kids up to age 18. I feel like we’re beating a dead horse a little bit here…there aren’t many places to stay in the Providence area. You’ll need to travel out of town if you want to stay at a campground. Or, if you’re feeling daring, you can try your hand at stealth parking in the city. Another alternative is to check with local RV dealers in Rhode Island and see if they’ll let you stay in their lot overnight. 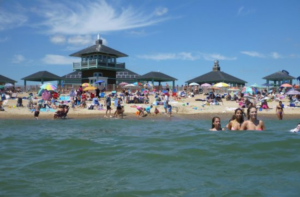 Consistently ranked as one of the top beaches in the state, Misquamicut Beach is the perfect place to take the kids for a relaxing day by the sea. You’ll have plenty of room to spread out and kick back – Misquamicut Beach is roughly ½-mile long. The pavilion has a few outdoor showers and a bathhouse where you can wash off all the sand before heading home. There’s also a gift shop, several concessions stands, and a few shady spots to cool off and eat lunch. Price: $6 parking for non-residents during the week, $7 on weekends and holidays. Burlingame State Campground covers more than 3,000 acres of woodlands in the Charlestown/Westerly area (about 15 minutes away from Misquamicut Beach). It’s a rustic campground, so don’t expect any utilities or high-end amenities, though there are shower facilities and a small arcade. The off-grid camping is worth it for the freshwater beach access and canoe rentals, though. It seems like Rhode Island is full of impressive lighthouses; Beavertail Lighthouse ranks among the top of them. 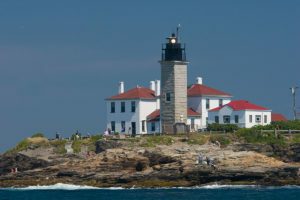 Built in 1749, Beavertail is the third-oldest lighthouse in the country. 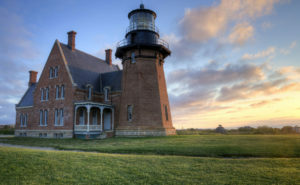 Though its architecture may not be as grand as the Block Island lighthouse, its stature sure is. The compound features a museum, a small theatre, a gift shop, oil storage, and two keeper houses. Guests can tour the lighthouse and grounds, learn about the lighthouse’s stormy history, visit the gift shop, or explore the adjacent Beavertail State Park. Fort Getty is located right in Jamestown, just across the bridge from downtown. It’s a 41-acre park that offers 83 RV sites and two dozen tent sites. There are walking trails throughout the campground, as well as a boat ramp and a small beach. Keep in mind that they have a 2-week minimum at $40 per night. If you’re not planning to stay in the area that long, you might want to check out this list of RV parking in Rhode Island for overnight spots in the area. Newport is famous for a lot of reasons. 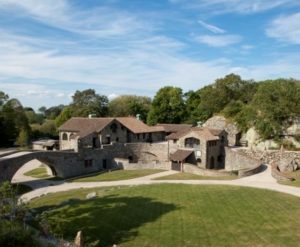 Lavish mansions, exciting nightlife, and arguably one of the most famous folk music festivals in the country can all be found here. Ten Mile Drive, however, offers a much more laid back, introspective experience for those looking to get away from the crowds. 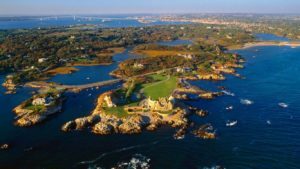 The route circles the south section of Aquidneck Island, offering stunning views of the Newport mansions and the Atlantic Ocean throughout its entirety. The most notable stop is Ocean Drive, where photo opportunities abound, and the ocean breeze is ever-blowing. You won’t find much in the way of RV parking in the Newport mansion district. Instead, you’ll need to head to Middletown, where you’ll find Meadowlark RV Park. They offer 86 sites, many of which have full hookups, or at least electric and water. Since it’s also a mobile home community and seasonal park, they offer laundry, WiFi, RV storage, and an accommodating staff. Rates vary from $45 to $65 per night. You don’t have to travel far for the next stop since it’s also in Newport. The Swiss Village is an authentic replica of an authentic Swiss village, complete with stone buildings, slender cypress trees, vegetable gardens, and plenty of open grasslands for the SVF’s rare animals. Though it used to be something of a full working village, it now serves as a protected habitat and cryopreservation center for heritage livestock breeds. You’ll need to time your visit perfectly; Swiss Village only opens to the public once each year, in June. Again, you’ll need to head to the north side of the island to find a suitable RV park. Head north to Portsmouth and you’ll find Melville Ponds Campground. It’s close to area stores, restaurants, and other local attractions. They offer full hookups, pull-through sites, and amenities like outdoor sports courts and a camp store. Rates start at $65 per night during peak season weeks. Rhode Island’s tiny size makes it a great place to really dive in and explore. Spend just a few weeks on the island, and you’ll feel like you’ve become truly ingrained in the local culture. Best of all, though, is that despite being the smallest state in the country, it still has plenty of attractions to keep you busy. From joining the beach crowd to spending some quiet time at one of the state parks, it seems there’s something for every type of traveler. One trip to the Ocean State, and you’ll find yourself pining for New England every summer.